One of the most fascinating parts about being in London in my opinion goes beyond the city and even the whole country itself. London is essentially the “New York City” of Europe — as a result, its size allows it to sustain many airports with thousands of travelers coming in and out of the city daily. This makes flying to different areas of Europe more affordable than I even imagined before I came here. Granted, every good trip still takes a bit of planning. I’ve certainly learned my lesson from this with my first trip to Amsterdam. With some crafty planning, my flatmates and I were able to secure a nice hotel to share just days before our departure, but I’m certain that I paid more for my plane ticket than I did for our housing for the whole trip. A warning to future study abroad students: secure your flight first! We experienced a jump in the flight price within the moment that we were attempting to book our flight on the website; as a result, we had to repeat the whole process with the new, more expensive price. Very annoying, but the ticket price was still much cheaper than what I would pay to fly across the United States. While it’s true that some things such as flights are best to plan out ahead of time, I think some of my favorite parts of Amsterdam were the spur of the moment activities we just winded up doing. Naturally, a lot of them involved food. After going on an extremely cold but enjoyable walking tour around the city, we stopped into an authentic Dutch pastry shop at the recommendation of our tour guide. 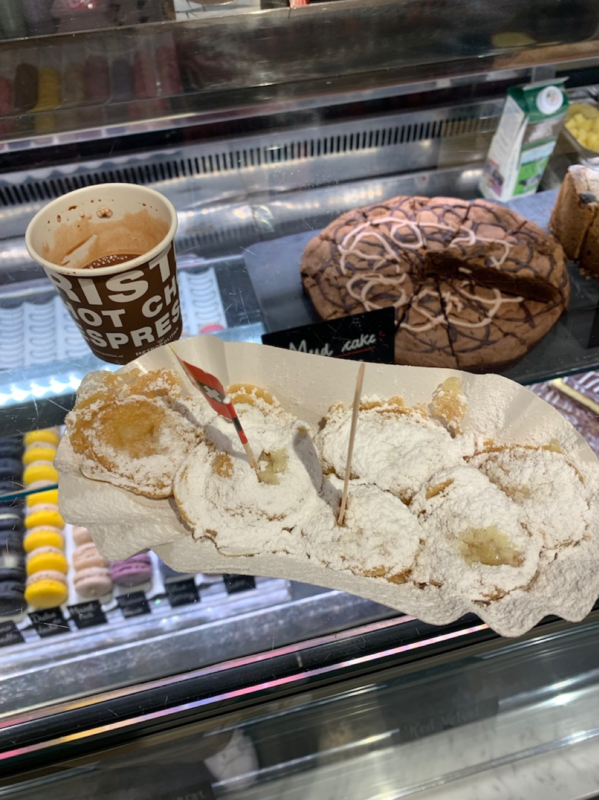 Here I purchased some very rich and delicious hot chocolate along with a traditional Dutch dessert called poffertjes, which are essentially mini pancakes with powdered sugar. Poffertjes — the cure to any sweet tooth! Sometimes we didn’t even choose to do spontaneous things; instead, they seemed to just jump out of nowhere! When we were walking by the Rijksmuseum, debating what we wanted to do next, we happened upon a very beautiful and expansive local market. If I had to choose one part of the trip that was my absolute favorite, it would certainly be this market. Every stand sold beautiful handmade products that ranged from local artwork, scarves and mittens, jewelry and even phone cases. 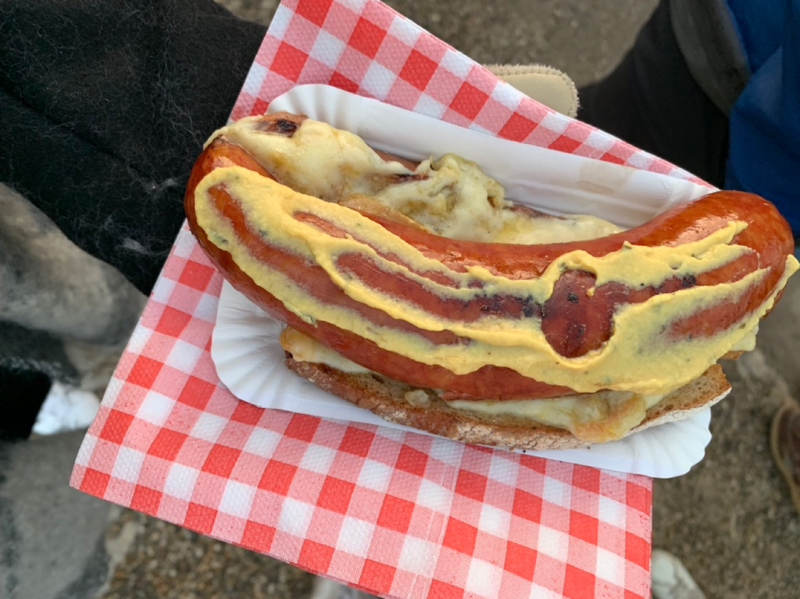 Pictured: an absolutely delicious sausage with cheese and mustard. Not pictured: me, freezing to death as I’m inhaling this sausage. Fresh oysters, because why not! Someone with me asked one of the local artisans how often this market occurred to which she responded “once a month”. I couldn’t believe our luck; we really were in the right place at the right time. There were many other activities I did in Amsterdam, from a classic canal tour to shopping around the city, which were all enjoyable and certainly worth experiencing. 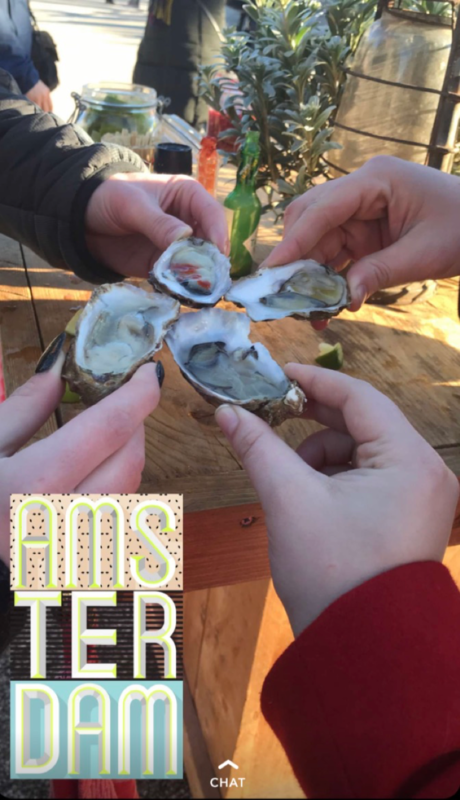 The experiences that I believe will stick with me, however, are definitely the ones where I felt that I was learning so much about the Netherlands and Dutch culture. While there are certainly activities in the Netherlands that require prior planning — the Anne Frank house being one in particular — I think that having the opportunity to not follow a strict itinerary and simply enjoy the city on its own made the trip that much more enjoyable. Living in London has in a way helped me to break out of the tourist mould; I feel much more confident going off the beaten path now than I ever was before I came here. Planning is of the essence, however. I’ve already got several more trips planned that I can’t wait to write about!